Ships from and sold by CEO Trade AU. 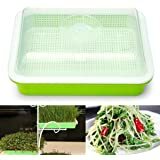 WESTLINK Seed Sprouter Tray, Big Capacity BPA Free Soil Free Hydroponics Sprouting Basket with Lid for home, office and garden use. 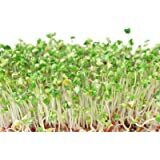 Healthy and green: Made from BPA Free PP Material.Sprouting without soil or chemical additives.Enjoy healthy sprouts for salads, sandwiches and soups. 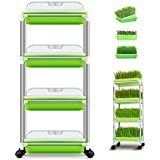 Easy to use: Follow the instructions,even children can sprout beans easily.Food grade PP material,safe and durable. 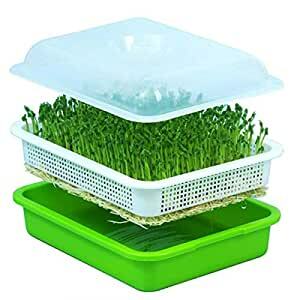 1.Please choose the seeds which are specifically for sprouting. Soak them in water. 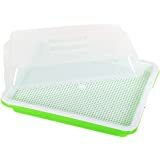 2.After soaking, pick out the bad seeds and put the good seeds in the grid tray evenly. Don't stack them. 3.Add water into the container tray. The water can't come up to the grid tray. Don't submerge seeds in water, otherwise it will rot. To avoid breeding bacteria and smell, please change water for 1~2 times every day. 4.Cover it with lid. If there's no lid, cover it with paper or cotton gauze. 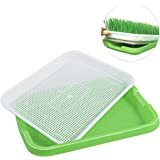 To keep the seeds wet, please spay some water for 2~4 times every day. 5.When the buds grow up to 1cm height, remove the lid. Spray some water for 3~5 time every day. 6.The seeds germination time varies from 3 to10 days. Before harvested, put them in sunlight for 2~3 hrs to increase chlorophyll.